If you drive I-70 in the Colorado mountains very often, especially on the weekends, any alternative to the gridlock ski traffic sounds great. So it’s of little surprise that a train to Winter Park for 75th Anniversary ceremonies on March 14th sold out in less than 10 hours. Amtrak obviously saw the dollar signs, and has wisely added a second train to the ski area for the following day, Sunday, March 15. Those tickets are available online now or by calling 888-923-7275. Tickets to and from the mountain cost $75, which includes $15 to spend at Winter Park, and the ride takes about two hours to pass from Union Station in Denver, over 65 miles, through 29 tunnels, and up 4,000 feet to stop near the Gemini Lift at Winter Park. The train returns at 4:30 p.m. 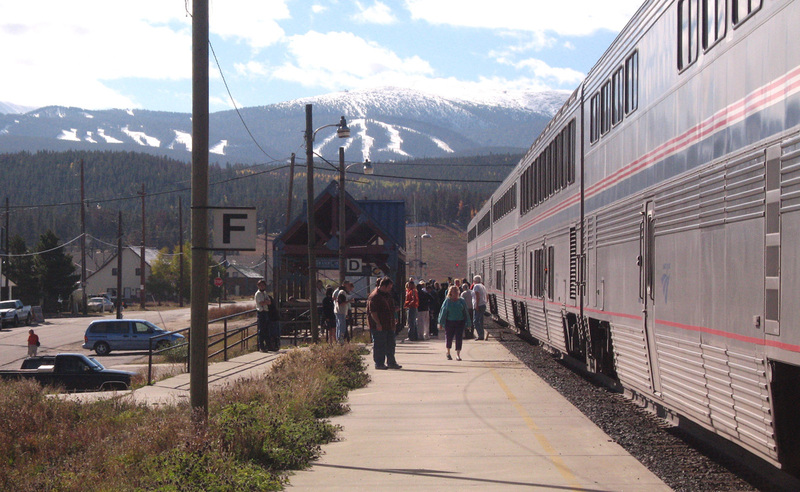 The Winter Park Express ran between Denver and Winter Park on weekends during the ski season from 1940 to 2009, when it was shut during construction at Union Station. With the frequently awful traffic to and from the mountains on popular holiday weekends, it seems like this service could be run at a profit with a little planning. And while a train to Summit County or beyond is unlikely, keeping a few hundred cars at home between Empire and Denver on any given day could make a difference. We hope Amtrak is taking note!